Hobgoblins are often mislabeled as savages and uncivilized due to their close relationship with the lesser goblinoid races. Nothing is farther from the truth. 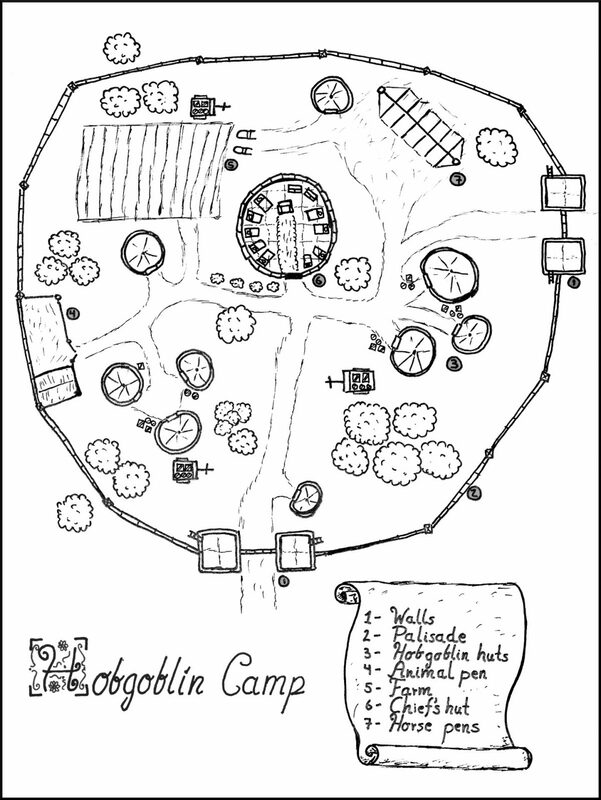 Hobgoblin societies do not reach the level of complexity of human civilizations for example, but they would surprise anyone unversed in the matter. They often build walled settlements and can take advantage of agriculture and animal herding. Other fact that is not noticed is how hobgoblins can become real masters in combat. Adventurers often seek hobgoblin battle-masters to train in temples hidden from the rest of the world. This is a small hobgoblin settlement that houses a tribe. The leader is the strongest hobgoblin, the person in charge changes all the time as there are duels for supremacy every month. Most leaders last for only a few months. The small village has a rudimentary farm and an animal pen with sheep.